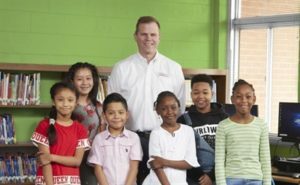 Q & A: Caley Edgerly Shares Commitment to Optimize Technology for Greater Student Safety | Sonny Merryman Inc.
Thomas Built Buses’ technological developments focus on getting kids to and from school safely every day and providing equal access to education for children who have no other way to get to school, Edgerly says. From its newly announced pedestrian detection technology to its engines created to eventually anticipate faults before they even occur, Caley Edgerly says that all of Thomas Built Buses’ technology is born out of a simple vision: to safely transport children to and from school every day. Spurred by the fatal accident in Chattanooga, Tennessee, in 2016, and the National Highway Traffic Safety Administration’s (NHTSA’s) recommendation to make electronic stability control (ESC) standard on buses, the school bus manufacturer made the technology standard on its Saf-T-Liner C2 bus. Thomas Built Buses is currently working on pedestrian detection technology that enables a driver to detect a child in the danger zone, and an auto-reversing entrance door that can sense any objects that may get caught, such as a backpack or jacket. Despite a somewhat moderate market trend ahead, the president and CEO of Thomas Built Buses says a bump should come from the Volkswagen (VW) settlement funds. On the horizon, he forecasts more powertrain options and safety features emerging as U.S. emissions and safety regulations tighten. Edgerly expands on these plans and offers other observations in this exclusive interview with School Bus Fleet. SBF: Thomas Built Buses announced pedestrian detection technology on its buses and made ESC a standard feature on its most popular bus. What prompted these decisions, and why was 2018 the year to debut them? We brought ESC to market in 2015 with the introduction of our BusWise technologies, along with several other safety features aimed at making school buses smarter, safer, more efficient, and easier to maintain. Just one year later, the horrific school bus accident in Chattanooga, Tennessee, shocked the industry, causing everyone to pause and analyze how school buses could become even safer. Following NHTSA’s recommendation to make ESC standard on all buses, along with trends in improved technology, we decided that making ESC standard on our most popular bus, the Saf-T-Liner C2, was the right thing to do. While producing safe school buses is our priority, we cannot ignore the fact that most accidents involving a school bus actually happen outside the school bus in the danger zone, an area where we have limited control. A study conducted by NHTSA in 2015 found that, of the injuries or deaths relating to school bus accidents, 8% involved passengers on the school bus, while 20% were pedestrians or children outside the bus. The rest of the casualties were passengers in other vehicles. While any accident is a tragedy, it is painful to think that most, if not all, of the accidents within the danger zone are preventable. Bus drivers are invaluable and likely underappreciated outside of the transportation department. As diligent as bus drivers may be, sometimes they just can’t see a child outside the bus. We believe it is our duty to make the entire school bus ecosystem as safe as possible. Safety outside the bus is just as critical as safety inside the bus. With our new pedestrian detection system, we hope to avoid unnecessary pedestrian accidents in the danger zone of a school bus. We’ve been working on the technology over the years and, while this prototype is proving to be a reliable, easy to use solution, it has gone through several iterations. We decided to introduce pedestrian detection to the market in 2018 and we anticipate it will be ready for production in 2019. We believe it is our duty to make the entire school bus ecosystem as safe as possible. Safety outside the bus is just as critical as safety inside the bus. In light of some tragic news stories in recent months, safety in school transportation has returned to the forefront of public discussion. How would you say Thomas Built Buses has contributed to making school transportation even safer? Something that we constantly remind ourselves of internally is that no matter how many times children have ridden a school bus, they are still full of curiosity, wonder, and lack of experience with large vehicles moving down the road. They are far more vulnerable at a bus stop or outside a school bus than they are inside the bus. And often when a parent is not at a bus stop to help, children are on their own, waiting for the bus or crossing a street to get home. As a school bus manufacturer, our purpose and passion is to make school buses as safe as possible. Whenever we hear of a tragedy involving a school bus, it causes each one of us great pain. Our hearts ache with the rest of the industry, and our minds reel with what-ifs. That’s why we are constantly activating swarm teams made up of employees, parents, partners, and vendors who brainstorm ways to make our school buses even safer. At this moment, we have an active team looking at stop-arm violations and how we can help end these preventable injuries and deaths to students through new product enhancements, helpful processes for districts, or even far-reaching awareness campaigns. We are actively working on innovative technologies that make riding a school bus even safer for children and easier for drivers. And we are empowering drivers to feel more confident about the job they are doing without adding unnecessary complexity. Thomas Built Buses staff reaches out to local students, such as those shown here, through sports, educational, and other activities. The PV360 technology, for example, allows a driver to easily see 360 degrees around the outside of the bus. This technology is the first layer of pedestrian detection technology. Now, tack on our new pedestrian detection feature, with sensors and ground lighting, and you have a much safer danger zone surrounding a school bus where drivers can more easily see children and reduce the number of accidents within this area. Taking it a step further, our auto-reversing entrance door is an active system, which, like an elevator door, automatically opens when it senses a backpack, shoe, or other object. This new technology, which is being piloted now, is aimed at preventing children from getting caught in the closing door. Thomas Built Buses has also come out with an electric school bus and added engines with remote diagnostics service to its buses. How do these as well as other recent developments align with the company’s vision? Our vision is simple: to safely transport children to and from school on our product every day. And all of these new safety features, powertrain options, and even our new Saf-T-Liner eC2 Electric school bus, are directly aligned with that vision. For example, our new Detroit DD5 and DD8 engines diagnostic feature through Detroit Connect Virtual Technician remote diagnostics service adds an unmatched level of support. Transportation directors and dealers are alerted as soon as a fault is triggered on a school bus. They are notified of how immediately a repair needs to be made and the parts necessary for the job. This empowers the driver and the districts to make sound business and operating decisions and improve the uptime of the bus, ensuring that children make it home safely and are not sitting on the side of the road. The diagnostics from the Virtual Technician service will only get smarter as information from school buses across the U.S. is gathered and analyzed, predicting faults and maintenance needs before they even occur. We will remain focused on what matters: picking up those smiling faces at the bus stop and delivering them home safely at the end of the day. How is the school bus market looking for 2019? We are seeing sales flat to moderate year-over-year, with some tailwinds stemming from the VW settlement. Currently, we aren’t seeing significant growth as an industry for a couple of reasons. The average age of fleets seems to be coming down slightly from its 2011 high, while the operating budget of many districts are leveling off or even decreasing. Transportation directors now more than ever are faced with large budgetary restrictions from competing priorities such as school bus driver retention, teacher pay, and aging facilities and infrastructure. Unfortunately, the transportation department is feeling pressure from the inflation of other items outside of school buses. Speaking of inflation, as an industry, we are also seeing the cost of raw materials increasing, which is impacting the overall costs of school buses. Even though the average age of school buses is decreasing, there are still quite a few buses across the U.S. and Canada that are more than 10 years old, which cost more to operate than a new bus. With the economy a bit more stable, districts continue to replace these older buses with new models to decrease their overall operating costs and provide safer rides for their students. Outside of market growth, we also are seeing a renewed interest in clean-diesel fuel. Diesel is still by far the number one fuel type in the industry and new clean-diesel technology like the new Detroit DD5 and Detroit DD8 engines is convincing the minority who were on the fence about diesel to reconsider its many benefits. In fact, diesel is comparable to if not cleaner than other fuel types, based on various EPA emissions standards. These new engines were designed with today’s emissions standards in mind, and as such, produce more heat to tackle emissions and less dependency on DPF systems. The new technology is getting attention. When we sold out of our allocation of the new Detroit DD5 engine just a couple months after introducing it to the market, we could tell that districts were excited about diesel again and eager to see what the future of diesel holds. 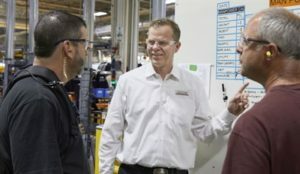 How are Thomas Built’s electric bus orders? What has the public reaction been? Orders are just now coming in for our Saf-T-Liner eC2 electric school bus, also known as Jouley. The level of excitement has been far greater than we expected, with local and worldwide attention in the international press. The Saf-T-Liner eC2 was showcased in Germany just a few months ago at the International Automobile Exhibition (IAA). Being featured at that show was unexpected and something we can be proud of. Over the past few months, we’ve been engaging with school districts and local agencies on use cases, technology options, and quotes for the eC2. For the first time, school buses are in line with commercial transportation and passenger cars in exploring the latest in electric vehicle (EV) technologies. It’s very exciting. The world of EV is progressing at a rapid pace and is only expected to accelerate, and we fully intend to be ahead of that curve. What emerging technologies do you expect to have a significant impact on school transportation in the near future? One area I am especially excited about is our work in decreasing the actual operating cost of school buses through machine learning. A school bus provides countless data points that we can analyze, using state-of-the-art technology to find trends and patterns that can help us improve our buses. What changes do you see on the horizon for the school bus industry? I see a significant shift in the industry as more powertrain options and safety features emerge. I also expect to see more features becoming standard as emissions and safety regulations tighten in the U.S.
One thing that I do not foresee changing is the culture of caring in this industry. We have a culture of purpose, building relationships, and a dedication to achieving high safety standards. We are focused on getting kids to and from school safely every day and to providing equal access to education for children who have no other way to get to school. We can talk about the next new feature, unveil the new shiny bus, or launch the newest app, but at the end of the day, it’s not about business metrics and budgets. It’s about our commitment to make school buses safer for the children and drivers who ride in them every day. Technologies emerging on the horizon will be focused on those core values. We will remain focused on what matters: picking up those smiling faces at the bus stop and delivering them home safely at the end of the day.